Grab your sketchbook today and go outside, find somewhere shady to sit and look around for something to paint. 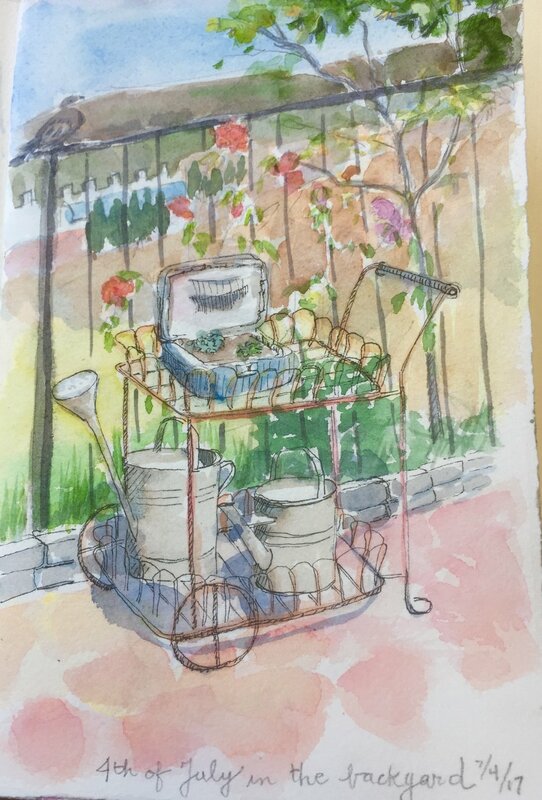 I painted the sketch posted below around 4pm in my backyard. I sat down under our patio umbrella, laid out my supplies and found a fresh page in my sketchbook. About then, I heard the voice of my inner critic saying to me, "What are you doing? The view is too difficult to paint." I spoke back to the inner critic this time ( I'd backed down many times before and I was tired of her nagging and low expectations). I politely said, "I really don't care what you think, I am going to try and we'll see what happens."